Why have you drawn on fascist imagery at this particular time and with this particular show? I don't really know, it's a sort of compulsion. 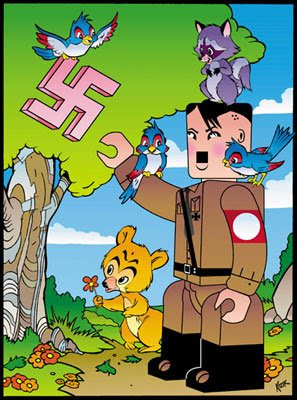 I mean, I do all sorts of stuff but the Hitler kitsch thing keeps drawing me back. Perhaps I'm insane. It seems to have some sort of magnetic appeal. Like, people hate it and like it at the same time. So, that's interesting. What would you say to people who are uncomfortable with the use of this imagery?